Perhaps Tweeting a picture of your hand spread out like a Thanksgiving turkey with a diamond in it isn’t the best idea? 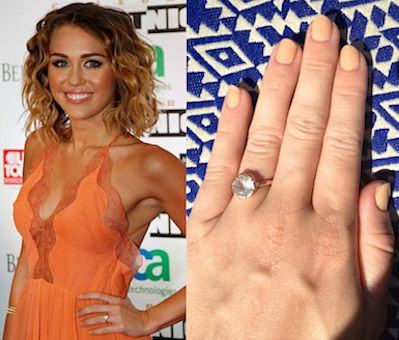 Another event that had people talking was Muhammad Ali’s Celebrity Fight Night gig in Arizona where Miley sported an orange dress, the ring and an autistic smile worthy of a high-security mental ward. I don’t why she doesn’t just get engaged now, to avoid people not caring (or believing it) when it does happen in the near future. You know Miley Cyrus was filming in Santa Monica when I lived there. I think there was a scene on the Santa Monica pier. We ate at Bubba Gump’s right there on the pier. We could see a sea of trailers for the stars of the movie parked on the lot. She was there for a bit but I never saw her. I’m not like a fan and I’m like not a fan consider me in different. Previous Previous post: Happy Glittery Butter[fly] Birthday Mariah Carey!